This is going to be quick. Mini-me is sick and is doing her regularly scheduled 9:30pm wakeup as I type. This cough is going to be the end of me. I've been slacking with the picture taking... apparently I'm desperately in need of Style Challenges to keep me accountable for pic posting and blog writing. That's okay... the winter challenge approaches! 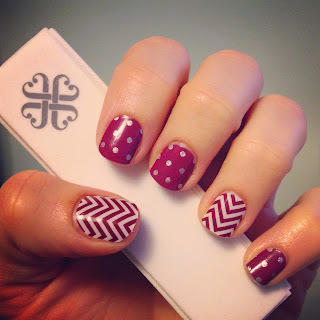 icy boysenberry polka and boysenberry chevron - my fav jamicure yet!! I'll endeavor to be more organized for next week but not promises. Also, I've realized that whenever I write about mini-me not sleeping on here, she has a few good nights... let's keep that up, okay? Much appreciated. 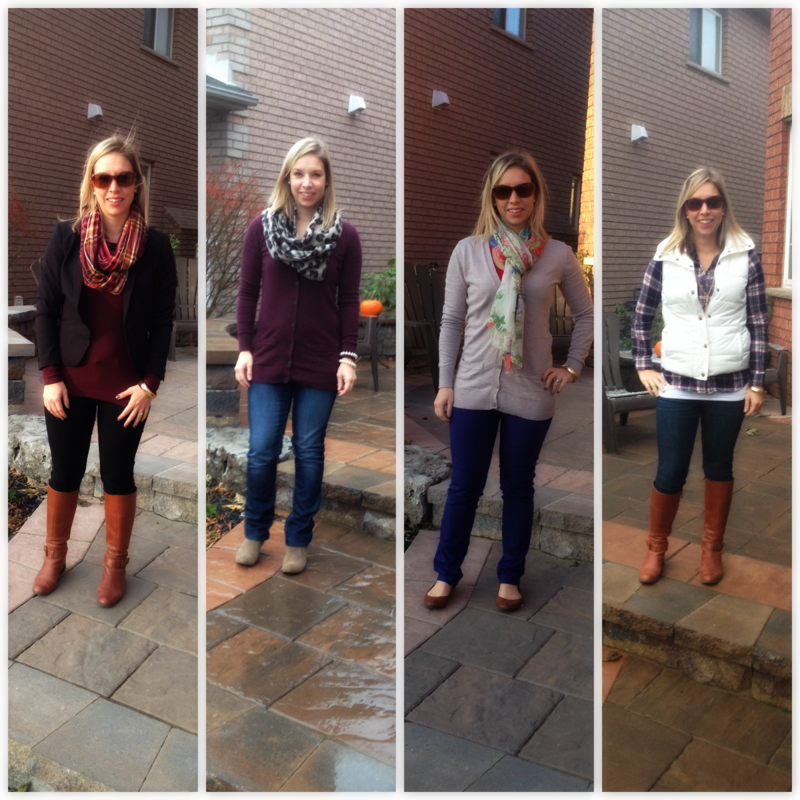 Cute layered outfits! Love the chevron design on your nails! Can't wait to try those nail wraps! I have to take a few weeks off from daily pics after each challenge. I know it only takes a few minutes, but something about adding an extra step to the morning routine gets old after a bit. Love the plaid/leggings/boots/puffer outfit. I might be recreating that for a girls trip this weekend! it really is challenging isn't it?! I really love that third outfit, the plaid with the white vest. I almost bought a white vest from ON with my ON cash, but decided on some other items instead. I almost bought that boyensberry polka dots, but I wasn't sure if I had a lot of that color in my closet (even tho it is a hot color this fall!). I love how you made your thumb and middle finger as accent nails. I may copy that, but with the wraps I ordered! lol! Mine if from Old Navy!! I can't wait to see your nail combos once they arrive! Cute looks. I love the scarves. I can totally relate to the kiddo not sleeping. We were there a few weeks ago. It's so exhausting. Love the Jamberry wraps! I love their stuff! noooooo don't tell me it could last that long... this mom can't handle it! oh your nails are so cute! Love Jamberry and how easy they are to apply. Love the outfit with the white puffer vest. And yes to the winter challenge starting, I"m slacking in my dressing department too. Although this morning I woke up super late and threw on a Fall challenge outfit and didn't have to think it was great. Love the nails! I have some jamberry product - think I'll use them tonight! do it!! so easy and so fun! Darling looks. Your scarves are really great accessories. Still looking for the perfect fall-colored plaid scarf here in El Paso. Are you guys having winter weather this week? Maybe these crazy weather changes are what's making mini-you sick. Hope you both sleep well tonight. It's supposed to snow tomorrow... yuck. Hope you find that perfect scarf soon! I say you start writing about your daughter's sleepless nights every day, and see what happens! Even with a sick kiddo, you look great. Heading over to your facebook page now - I really want to try the nails. Oh no!! I'm so sorry she's sick! Mia has been fighting a cold for OVER a week now and I'm so, well, over it! Ha! Seriously though, the coughing is the worst part!! Hope she gets better asap and you both can get some sleep! Great use of scarves this week! And I love your nails!